Ryan Farquhar has been moved out of the intensive care unit and his condition is described as "stable" as he continues his recovery from injuries sustained at the North West 200. Farquhar, 40, suffered six broken ribs and a lacerated liver after crashing in the Supertwins race on Thursday 12 May. The Dungannon man had previously been stable in the Royal Victoria Hospital. However, the Belfast Trust had indicated on Sunday that the motorcycle racer was "seriously ill". Farquhar was involved in a high-speed accident during the opening Supertwins race and was taken from the track to hospital in Belfast by police helicopter. The Belfast Trust initially described the County Tyrone rider as "seriously ill", but he was subsequently moved out of intensive care, before being re-admitted to the unit on Sunday. The five-times North West winner, who resumed road racing in 2014 after retiring in 2012, and Dan Cooper, came off their bikes on the the Black Hill section of the course. Cooper was taken to the Causeway Hospital in Coleraine with shoulder injuries but was later discharged. English rider Malachi Mitchell-Thomas was killed in a crash at the same part of the course during the second Supertwins race on Saturday 14 May. 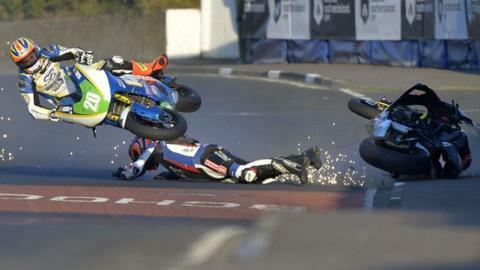 BBC iWonder: Why are road racers willing to take such risks? Read more on BBC iWonder: Why are road racers willing to take such risks?